Our annual concert at Austintown Township Park kicked off this year's Independence Day celebration for Austintown with an epic performance of John Philip Sousa's "The Stars and Stripes Forever!" Piccolo Palooza featured the famous piccolo solo performed by 64 guest piccolo players joining with the Canfield Community Concert Band for the final strain of the march. It was an exciting performance and fun for all involved. Thanks to all of the participants for taking part in this event. We've media from the event here. Follow us on Facebook and YouTube to stay updated on all of our events. UPDATE: 6/29/17: Please note some time changes: the Park Vista concert on July 11 begins at 6:00 pm, not 7 as originally listed; and the Buhl Park concert on July 26 begins at 6:30. 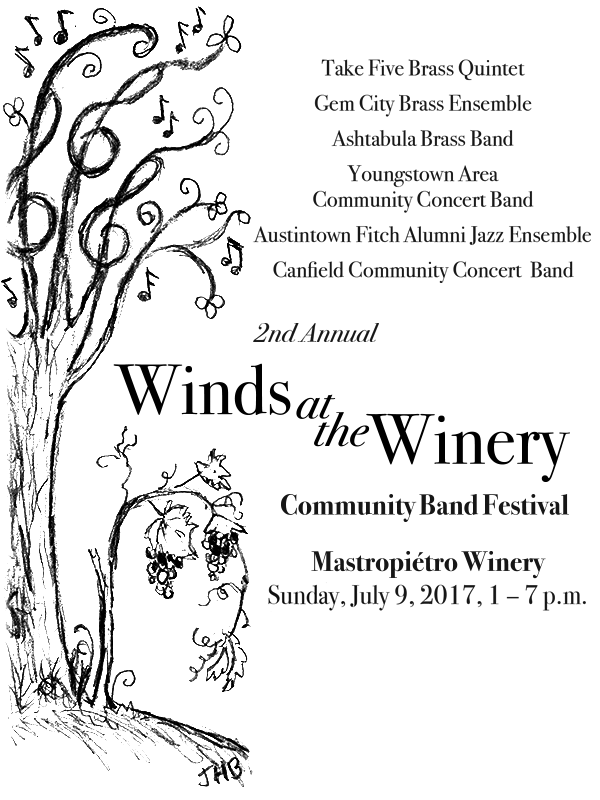 Our next event is the Winds at the Winery event on July 9 at Mastropiétro Winery. Guest bands will be performing throughout the day starting at 1 pm; our performance begins at 6. We still need some volunteers throughout the afternoon, so contact Alice Cooley if you can help. Also note that there is no rehearsal next Tuesday due to the 4th of July holiday. Summer has arrived and we will begin our outdoor concerts next week with our opening performance on the green in Canfield. Concerts are scheduled throughout June, July, and August and there will be only a couple of rehearsals in between. Download a printable schedule here and always check our upcoming events page for updated information. Rehearsal dates that are posted are tentative, but will most likely be confirmed as they appear now. We are pleased to present the second annual Winds at the Winery Community Band Festival! Spend a summer afternoon at the winery and enjoy several local community bands. Food and Wine* will be available for purchase throughout the event. Performances by Take Five Brass Quintet, Gem City Brass, Ashtabula Brass Band, Younstown Area Community Concert Band, and Austintown Fitch Alumni Jazz Band will take place throughout the afternoon, starting at 1. The evening will conclude with a combined performance of Stars & Stripes Forever by all festival musicians. There will be a 50/50 drawing, a raffle, and donations will be accepted, all to benefit Rescue Mission of the Mahoning Valley in support of their Move Our Mission capital campaign. Raffle tickets will be sold throughout the event for $1 each. CCCB members will be selling them in advance of the event as well. The drawing will occur just before the grand finale performance. First prize is an Apple Watch, second prize is a 1-year subscription to Apple Music, and third prize is an Amazon Fire Stick. Winner does not need to be present. Wine and beer will be available for purchase from the winery and food and snacks will be available from food trucks and the winery. You may bring your own food, however Ohio law prohibits anyone from bringing alcoholic beverages onto Winery property. Picnic tables and chairs will be available on a first come first serve basis, but you are welcome to bring lawn chairs or blankets and sit on the lawn. We are deeply saddened to learn of the passing of Lynn Beatty, mother of our Assistant Music Director and Tuba player, Travis Beatty. We join with Travis and his family today in mourning her loss. Calling hours will be held today from 4 to 7 p.m. at Cunningham-Becker Funeral Home, 244 McGill St., Lowellville. Our rehearsal for this evening has been canceled.